†For a limited time, become a new Scotiabank Passport Visa Infinite credit cardholder and earn a one-time 30,000 Scotia Rewards point bonus with your first $1,000 in everyday eligible purchases if made within the first 3 months (the "Bonus Offer"). Bonus Offer ends June 30, 2019. Conditions apply - see below1 for further details. Bonus Offer may be changed, cancelled or extended and cannot be combined with any other offers. Plus, as a Scotiabank Passport Visa Infinite credit cardholder you are always eligible to earn an annual 10,000 Scotia Rewards point bonus when you spend at least $40,000 in everyday eligible purchases annually on your Scotiabank Passport Visa Infinite account. Conditions apply - see below2 for further details. 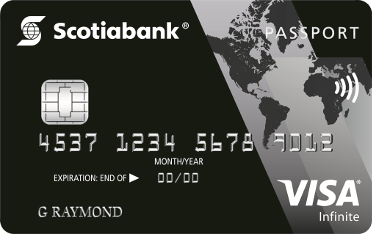 The current annual fee for the Scotiabank Passport Visa Infinite credit card ("Account") is $139 for the primary card, $0 for one additional supplementary card and $50 for each additional supplementary card thereafter. The current preferred annual interest rates for this Account are: 19.99% on purchases and 22.99% on cash advances (including balance transfers, Scotia® Credit Card Cheques and cash-like transactions). All rates, fees, features and benefits are subject to change. 1To be eligible for the 30,000 bonus Scotia Rewards points (the "Bonus Offer"), you must have at least $1,000 in eligible purchases posted to your Scotiabank Passport Visa Infinite credit card account ("Account") in the first 3 months from the Account open date. Eligible purchases include purchases (less any refunds, returns or other similar credits) but do not include payments, cash advances (including balance transfers, Scotia® Credit Card Cheques or cash-like transactions), interest, fees or other charges. Any bonus points received under the Bonus Offer will be credited to the primary cardholder's Scotia Rewards account within 5 to 10 business days after the first 3 months has passed, provided the Account is open and in good standing at time of payout. The Account is considered in good standing if it is not delinquent (past due) or over limit and the Cardholder(s) is not in breach of the Revolving Credit Agreement that applies to the Account. Former or current Scotiabank credit cardholders of any kind in the past 2 years, including those that transfer from an existing Scotiabank credit card account or re-open a closed Scotiabank credit card account, are excluded from this Offer. Offer may be changed, cancelled or extended and cannot be combined with any other offers. 2As a Scotiabank Passport Visa Infinite credit cardholder earn an annual Scotia Rewards point bonus starting at 10,000 bonus Scotia Rewards points when you make at least $40,000 in eligible purchases annually on your Scotiabank Passport Visa Infinite account ("Account") each year (12-months). Eligible purchases include purchases (less any refunds, returns or other similar credits) but do not include payments, cash advances (including balance transfers, Scotia® Credit Card Cheques or cash-like transactions), interest, fees or other charges. Annual period starts from the Account open date and resets every 12 months thereafter. You will earn 2,000 bonus Scotia Rewards points for every additional $10,000 in Purchases thereafter in that same year, after the $40,000 annual spend has been reached. Annual bonus Scotia Rewards points will be applied within two statement cycles after you have met the $40,000 annual spend threshold on the Account or within two statement cycles after you have met each additional $10,000 annual spend threshold on the Account, provided your Account is open and in good standing. The Account is considered in good standing if it is not delinquent (past due) or over limit and the Cardholders(s) is not in breach of the Revolving Credit Agreement that applies to the Account. For all you frequent flyers, the Scotiabank Passport™ Visa Infinite* can easily get you to your next destination and provide you with extensive luxury travel benefits and insurance, with the added benefit of no foreign exchange fees. This is a rarity for credit cards in the Canadian market as of late, which is why travellers across the country are currently going crazy over this card. The Scotiabank Passport™ Visa Infinite* earns two Scotia Rewards points on every $1 you spend on eligible grocery stores, dining, entertainment purchases, and daily transit purchases (including buses, subways, taxis and more). You also earn one Scotia Rewards point on every $1 you spend on all other eligible purchases. New cardholders are also eligible to earn 30,000 bonus points with their first $1,000 in everyday purchases in the first 3 months of cardmembership. And in terms of perks, the Scotiabank Passport™ Visa Infinite* comes with a lot of competitive travel benefits and rewards on everyday purchases. Within three months, the card already reaps benefits, as their bonus point offer alone qualifies for a flight worth $250. But you can also use the points towards accommodations, gift cards, merchandise from Apple, Best Buy or other brand names, a donation to charity, or even a credit towards your account so your balance is reduced. The card also has a flexible redemption process which makes it a decent everyday option. No foreign exchange fees on international purchases. As mentioned before, cardholders get a bonus 30,000 Scotia Rewards points once they spend at least $1,000 in net purchases (purchases less returns, refunds or other similar credits) in the first three months from the date the account was opened. That's worth $300! Cardholders are eligible to earn an annual 10,000 Scotia Rewards point bonus if they spend at least $40,000 in everyday eligible purchases. The first supplementary card is free, so you and your partner, spouse, etc. can work towards your next trip. Cardholders aren't limited to black-out periods or booking with specific airlines when using this card. Bookings can be made through the Scotia Rewards Travel Service, which also comes with the benefit of the Best Price Guarantee on airfare. If you book a flight on the Scotia Rewards Travel Service site or with a Scotiabank Travel Rewards Representative and, within 24 hours, find a price for the exact same itinerary that's at least $10 less, Scotia Rewards Travel Service will offer you a points credit equal to the price difference, per passenger. Alternatively, cardholders can book travel online or through a travel agency and redeem Scotia Rewards points to cover the cost of their trip. The card carries a $139 annual fee. You need to redeem a minimum of 5,000 points if you are looking to redeem points for a travel purchase. But if you receive the 30,000 bonus points, this may not even be a problem. Complimentary airport lounge access (Priority Pass™ membership), with six passes per year from the date of enrollment. This is impressive since not many Canadian credit cards only offer more than four lounge visits per year. Complimentary Avis® Preferred Plus membership. Access to Visa Infinite Benefits, including the Visa Luxury Hotel Collection and Infinite Concierge. With the Luxury Hotel Collection, you're guaranteed the best available rate, upgrades, complimentary meals and VIP treatment when you book with certain premium hotels like Peninsula, Park Hyatt, and Shangri-La. Infinite Concierge offers 24/7 complimentary personal assistance in planning your trip, accommodations, and reservations.